Phase conjugation is originally and classically understood in the optics literature. You take pairs of laser beams precisely approaching in opposite directions. If they meet (and conjugate') perfectly - then at the center - they Phase Conjugate. So how do lasers meet to conjugate? When they meet in precise opposing pairs - this is often called four way mixing. Getting opposing exactly phase locked laser beams to align this way, is very tricky, and very expensive because you need alignment accuracy down to angstrom levels. I have often suggested that the best way to visualize how wave fronts meet to phase conjugate is to visualize pine cones learning to kiss noses. This also nicely introduces the vision of vortex learning to meet each other on the head of a pin. So the spiritually correct question is not the ancient question "how many Angels meet on the head of a pin", but rather how is it that phase conjugation is the solution which allows an infinite number of (wave) Angels meet there.What optics has proven is that this conjugating (charge) wave geometry illustrates for physics the first real evidence of SELF ORGANIZATION and NEGENTROPY. 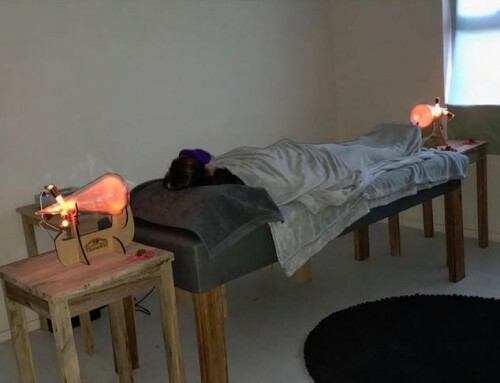 Now imagine what it takes for the brain waves inside your head to get aligned in this way in order to produce the implosive focus we know is the hallmark of deep spiritual perception and psychokinesis. We shall see in (a later blog) using brainwave measures exactly how this is quantified, by applying the golden ratio as well. It would be appropriate here - to ask ourselves if we understand what the physics literature means - when it talks about how phase conjugate optics produce "self organisation"? In optics this means that the local wave phenomenon seem to "self organise" themselves using Phase Discipline such that any wave which is "out of phase" or "does not fit the nest" is either cancelled or reorganized into phase. The point here is that we must visualize and understand for ourselves in an empowered way as to why or in what symmetry would waves cause this seemingly "magic" self-organising phenomenon (which by the way is so essential to our understanding life itself). In optics the arrival of two opposing lasers in a special media is described as a non-linear Phase Conjugate Mirror. Here again as I have so often suggested the metaphor of two pine cones learning how to kiss noses, is I think instructive. The pine cones are merely a metaphor for what apparently are opposing vortices that learn how to stand on the head of the "pin head" of convergence. The concepts of the opposing focused laser beams talking to each other through a focused pin head, is reinforced by the famous absolute precision required to get laser beams to converge and phase conjugate. Angstrom level accuracy is required and is obtained by the use of an expensive super stable light table which does not move an angstrom even when a truck drives by. If we were to image what is happening when these cones of optical focus converge (image above) we would have to conclude that the inner circuits of the pine cone have PHASE velocities which are not only coherent but certainly faster than the speed of light. This is also consistent with the qualities of "everywhere at once" kind of charge distribution which is so famously associated with phase conjugate dielectrics. In order to account for the way phase conjugate wave systems communicate it is absolutely essential to consider faster than light wave-phase velocities. We have long been working on a detailed model for how golden ratio vortex phase conjugation produces faster than light speeds. Notice in the image how waves, by converging in golden ratio phase conjugation, produce the only possible symmetry which allows them to both add and multiply. This recursive constructive behaviour of both adding and multiplying are the signature definition of the golden ratio. It is the only proportion or ratio which allows wave lengths to both add and multiply. Recursive addition is multiplication and this is essential to the notion that the golden ratio is the optimisation of ideal recursive constructive wave interference and therefore the ideal essence of Fractality in Wave Mechanics. Let's re-examine our image above and see if we understand for ourselves why this perfect cone vortex of golden ratio phase conjugation solves both infinite compression and the origin of gravity. Remember our new proofs regarding this accurately define the radii of hydrogen. As the wave proceeds inward on the cone- in order to create only constructive wave interference, the sine waves must converge the golden ratio proportions. The point here is that at each cross point of the waves- the wave nodes- the wave interference phenomenon both adds and multiplies. Note that the golden ratio progression is the only geometry which supports BOTH adding and multiplying to achieve constructive wave interference. You can see visually how the golden proportion invites this recursive constructive wave interference to proceed theoretically to some "infinite" limit. Actually our equations for the wave lengths and frequencies of all self organizing phenomenon, especially life force (in the form of photosynthesis dimensions- etc. ), strongly suggest that this "infinite" limit is definitely the Planck time and length dimension. This makes sense as physics rather agrees the Planck wave dimensions in time and space are the common musical key signature of all of matter (literally the dimensions of the "sacred"). What is especially important to point out here is that golden ratio constructive wave interference in this geometry is not just constructively adding and multiplying wave length, but in fact and perhaps more importantly, is a significant component of the charge wave inertia ( in golden ratio hydrogen for example) know as phase velocity. So a portion of the wave that was undergoing constructive compression by golden ratio is now also undergoing acceleration. In this way - the golden ratio - allows a portion of the constructive compression of charge to turn into the constructive acceleration of that charge. Although some would quibble I still believe that in fact the acceleration of charge is in truth indistinguishable from gravity. In other words this is the origin of acceleration of charge which we call gravity. In summary golden ratio conjugate wave geometry is therefore the only form of charge compression which by its (perfect golden ratio heterodyne) geometry turns compression (of charge) into the acceleration of charge. Thus phase conjugation as the way initiating charge acceleration I hypothesize is the only reason the gravity exists. repeatedly sketched them in variations, not knowing what they really meant. Later i came across theories of vortex and torus energy ( Bentov, Wallter Russell, Haramein) and it started to make sense. The addition of phi ratio is brilliant. I also recently experienced a shift in my literal vision for a few hours: went from 20/40 to 20/20 after attending a new life expo. It made me wonder if it was caused by a resonance or shift in my energy which balanced my visual perception through phase coherence or re-alignment? Thanks for all your research and insight! I am living this. I have turned back aging and reversed the degradation of my cellular DNA. In my experience I actually encountered and engaged my “sole mate”. In reflection through a “Magick Window” Frequency I re-established balanced Uracil which allowed me to begin Refracting light again to fuel my Merkabah. 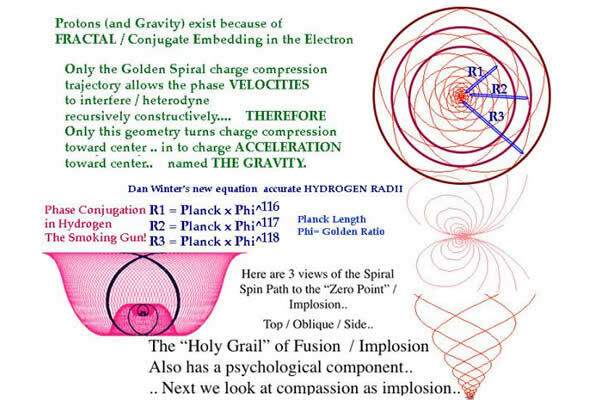 During the fusion it was very much an Implosion. In hind sight, as a Prophet I now comprehend that Prophets cannot be intimate, nor attempt to mate until they have eclipsed Cosmic Consciousness and embrace their role. Dan thank you for your research. The “7-Axis” comment has allowed me to propel my comprehension why our Ancestors with Vision did not require Eyesight. It is only as the Pineal became dormant that 7 “Axis” or ‘Sensors” were activated by the Pineal; (Nose, Eyes, Ears and Mouth). Due to DIET the Pineal has remained dormant and the HU-man remains absent of the capacity and adequacy to Enlighten, Ascend and Illuminate. In the absence of Sacred Geometry, ONLY Power of Intention can Ascend one, and few have the diligence, nor wherewithal to learn. Pineal is the “Zero-Point” for Photo-Atomic Conversion, “Light from Thin-Air”. I have experienced the Photons form into Light at my Crown Chakra as the Double-Helix of Light Appears as I Ascended to the Stargate Angel: Ra’s Merkabah from Rasta Merkabah.